Marriage alone is difficult. It takes hard work and a daily commitment to walk together in rain or shine. Jobs, mortgages, children, money, they all only add to the load, but being in a relationship with someone who suffers from a mental illness, like Bipolar Disorder, makes it even harder. So, what happens when that load is carried more by one partner than the other? What about when resentment makes loving someone almost impossible? 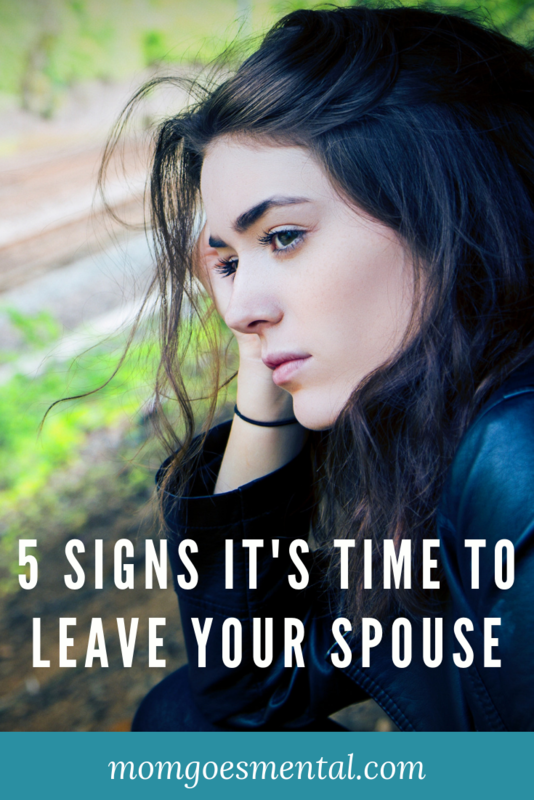 No one wants to give up on someone they love, but at what point does your spouse’s actions make marriage a detriment to you, enough that leaving is a better option than staying? Hands down, physical or emotional abuse is a reason to leave immediately. Absolutely no one should be in a relationship with someone who purposefully hurts them physically or psychologically. You’re worth more than that, period. For parents, it’s doubly important to get out as soon as possible. Not only are you putting yourself and your children in danger, but you’re modeling for them the type of relationship they will assume they’re worth in the future. If you or someone you know is in an abusive relationship, here are some resources that can help. Although I’ve had friends who have been able to recover from infidelity, the vast majority of people I know and those I’ve studied through research have not been able to continue a marriage after an affair. Not only is infidelity hurtful in the deepest of ways, but it is physically dangerous, as your partner risks exposing you to a myriad of sexually transmitted diseases. Substance abuse is tricky because addiction is a disease in itself. Addicts can be addicted to specific substances themselves or simply to the act of self-medicating rather than seeking treatment for their mental illness. Being in a relationship with an addict, even one in recovery, can mean that you end up with a destructive parent-child dynamic where you assume a controlling demeanor in an effort to keep your partner clean. More, there is no guarantee that recovery will last. If your partner or spouse is an addict, the first step is to encourage them to go into recovery. If at all possible, remove them or yourself (and your children) from the same household. There are many organizations that will help you or the addicted person with housing, treatment, and recovery support. You can find some here. More than anything else, keep in mind that just with mental illness, being an addict is not a choice. Addiction is medically and scientifically a disease—this is a proven fact. Addiction changes the brain so that willpower alone cannot heal them. It is not a moral failing on their part, and it was not caused by anything you did. I promise you that your loved one is still in there. Though addiction can most definitely be a reason to leave a partner, there is a strong correlation between mental illness and addiction. Through detox, residential rehabilitation (I recommend long-term in-patient stays to begin with), step-by-step meetings, and a lot of support, your spouse could be successful in recovery and managing their mental illness. Addiction is a family disease, and no one is going to blame you for leaving if it’s too much to bear. Your wellbeing and happiness is important, too. Habitual lying is a symptom of many who live with mental illness. Whether your spouse is lying because they are experiencing a manic episode, embarrassed about where they were or what they were doing, or lying to get what they want, the end result is largely the same. Trust is eroded, and their lies hurt. For me, because lying eats away at the absolute foundation of a marriage, this one is particularly hard for me to be understanding of, and it is most definitely enough of a reason to leave your partner. At the end of the day, no matter what the signs are, you have to be ready to leave. You have to be ready to sign the papers, divide your assets, coordinate living arrangements, and tell your kids. If you’re unable to let go or can’t face your children, it might not be the time for you to make this decision (with the exception of abuse). Living with a mental illness and being married to someone who is also Bipolar means that I’ve inevitably thought of divorce at one time or another. Personally, I found comfort in this divorce readiness article by therapists and divorce coaches, Bruce Derman and Wendy Gregson, and I’d recommend it to anyone thinking about divorce. I realized that in my case it wasn’t divorce I was looking for but an end to the ups and downs and frustrations that was my life. I’d highly recommend seeing a marriage counselor either with your partner or, at the very least, on your own. You may find there are ways to make your marriage work for you, or you may find that you are more ready for divorce than you believed. No matter what path you’re on, though, remember that it’s never wrong to put your own needs first. Being with someone who is mentally ill is challenging to say the least, and it does not make you a bad person for needing to get out. You are valuable, and your mental health is important, too. I’m so sorry that you’re feeling that way, Erika. I advocate for both divorce and marriage, and I think you have to choose which is right for you based on your situation. If you can, seek counseling and resources that will help you decide what is best for you and your family and how you can take those steps. It’s never an easy decision either way. Sending you big hugs!